Vending machines contain a lot of amazing technology. This includes scanners to read dollar bills, robotics that select the beverage, and in some cases I've even seen machines that are connected to the Internet and accept credit cards. 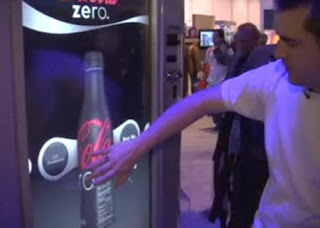 Now Sapient is bringing Coke machines to market that are touchscreen. Basically the entire front of the machine is one big touchscreen. Customers can actually rotate the bottle on the screen to read ingredients, see the whole label, etc. It will even be one of the credit card accepting types. Sources say it should be seen in the US soon. Personally I'm thinking these machines will see a definite spike in business from people who are willing to buy a drink just to get a chance to play with the new machine. I know I'd be willing to plunk down a credit card and buy a Coke just so I can spin the bottle on the screen. The history of mathematics goes a long way back with devices and methods of calculation. calculators and finally the electronic computer. This is awesome a touch screen vending machine and that will solve a lot of the language barriers truly.